Welcome to the World of the Golf Chucker! About 10 years ago, at Calamigas Ranch in Malibu, CA, the father-son team of Grant and Glen Gerson developed the Golf Chucker to provide a method for wheelchair-bound persons, most especially Wounded Warriors returning from the Middle East conflicts, to play golf. From these early beginnings, born from a loving heart, has come the World’s latest outdoor sport, Chucker Golf. The Chucker Golfer comes from all walks of life; young and old, abled or disabled, athletic or non-athletic. Although not difficult to learn, Chucker Golf requires a certain level of concentration as is required in Golf. The approach shot is a matter of feel and is never quite the same for each shot. The Chucker Golfer is a business person pressed for time, a newly-retired person seeking fun outdoor activity that does not require hours of practice. The Chucker Golfer is the disabled veteran looking for an activity that is challenging and allows for inter-action with abled-bodied friends and family. The Chucker Golfer is the child or grandchild holding hands with a Parent or Grandparent as they stroll the fairways of their favorite golf course. The Chucker Golfer is the Parent or Grandparent fortunate enough to have a child or grandchild to stroll the fairways with. 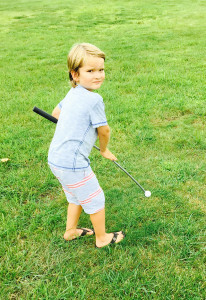 Chucker Golf is the ultimate outdoor family activity. The benefits are numerous. Family bonding, physical exercise, friendly competition, and a simple, inexpensive way to spend quality time with family or friends. “Chucker Golf is a Good Walk, Enhanced”! Using just a “Golf Chucker”, players can play 18 holes of golf using the registered Par for the course! The forward Tees are recommended in order to keep the relationship to Par intact. Players can “Chuck” (throw) a golf ball up to 150 yards with the “Golf Chucker”. The Game is played as follows: A player starts at #1 Tee and “Chucks” the ball down the fairway using an overhand vertical throwing motion, as in serving a tennis ball. (Recommended). The player continues this “Chucking” motion for shots that are considered “full” shots. After reaching a point, either on the putting surface or within pitching or chipping distance from the hole, the player converts to an underhand vertical motion (Recommended) to play either a lob, pitch, chip shot or putt. Using the opposite hand as a stop the Player can create a putt, chip shot up to a lob shot, depending on where the player positions the opposite hand in front of the Golf Chucker. Take the opposite hand and place it across the front of your body with the palm of your hand extended. Positioning the opposite hand just above the ball creates a low running shot and a progressively higher position creates higher shots. Once on the putting surface, the player determines if the ball lies outside Pin length; continue playing or; inside Pin length but outside 12″ from cup (“Gimme” , pick up ball and add a stroke.) Inside 12″ is considered “In the Hole” except on the first shot each hole. The score is recorded for that hole and the player proceeds to the next Tee.Got a friend you would like to include in your week-end group? Got a non-golfing Friend you would like to include in your group? Chucker Golf is the answer! 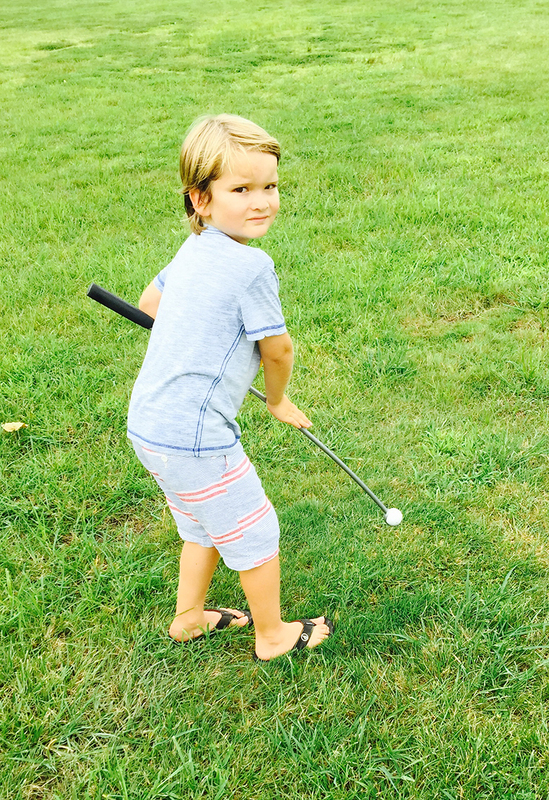 Chucker Golf can be learned in approximately ten to twenty minutes! A player can play an 18 hole round on the first day exposed to the Game. A Group missing a fourth player can add a Chucker Golfer with ease. Four Chucker Golfers can play in the same rotation as regular golfers and most likely at a faster pace. Both games are played with basically the same Rules with the exception that Chucker Golfers never have a bad lie. You simply pick the ball up and place it in the Chucker and “Chuck” it from the same spot it was found. Although it allows for walking to be more of an option by eliminating 13 clubs and a golf bag, this is not the intent. The intent is to bring more “Golfers” to the game. Chucker Golf can be used to introduce players to the Game of Golf or used as another Game to be played on a Golf Course. Unlike several games being promoted as “Golf”, Chucker Golf actually uses a golf ball and follows the Rules of Golf with only a few exceptions dealing with touching the ball and playing from the same spot. Using just the “Golf Chucker”, a player can play 18 holes of golf using the registered Par for the course! Golf Chuckers are available now, so order yours today! The Family Pak (4) provides the family an opportunity to spend quality time together outdoors and saves you $20. It includes two full-size and two smaller size Golf Chuckers for the kids in your family. NOW AVAILABE IN CUSTOM COLORS!